The chair of the Mayo Clinic Department of Laboratory Medicine and Pathology, Frank Cockerill, M.D., participated yesterday in a roundtable discussion, hosted by the U.S. House of Representatives Energy and Commerce Committee. This was the third roundtable discussion in the 21st Century Cures initiative. Chairman Fred Upton (R-MI) and Rep. Diana DeGette (D-CO) led the discussion on personalized medicine with participants from the U.S. Food and Drug Administration, the Ovarian Cancer Society, Leukemia and Lymphoma Society, MD Anderson, Duke University Health System, Genentech, Mayo Clinic, American College of Cardiology, Abbott Molecular, the Personalized Medicine Coalition, and Apple Tree Partners. Participants discussed how advances in areas such as genomic sequencing and diagnostic testing can accelerate the pace of cures. For more details from the hearing and the opening statement, please click here. As of today, women in 31 states leave their yearly mammogram appointment without the knowledge of their own breast density number. This single data point is important in tailoring personalized care for each woman, and assisting in possible further preventative care. Are You Dense, Inc. released a press release announcing the passing of the 19th state bill, which made into law in the state of Missouri, to include breast density information in a patient’s mammography reporting results. “Too many women are unaware of the effects of breast density, but this knowledge can save lives by leading to earlier breast cancer detection,” notes Representative Sue Allen of Missouri. Hitting closer to home here at the Center for Individualized Medicine, Deborah Rhodes, M.D., has been working with a team of researchers to develop a new tool that is 3 times as effective as traditional mammograms for women with dense breasts. By offering another option for cancer detection, Dr. Rhodes, and the team at Mayo Clinic, are creating more individualized options that can help with early detection of tumors in the breast. Watch Dr. Rhodes speaking at TEDTalks on the research being done at Mayo Clinic, and the story behind the work. 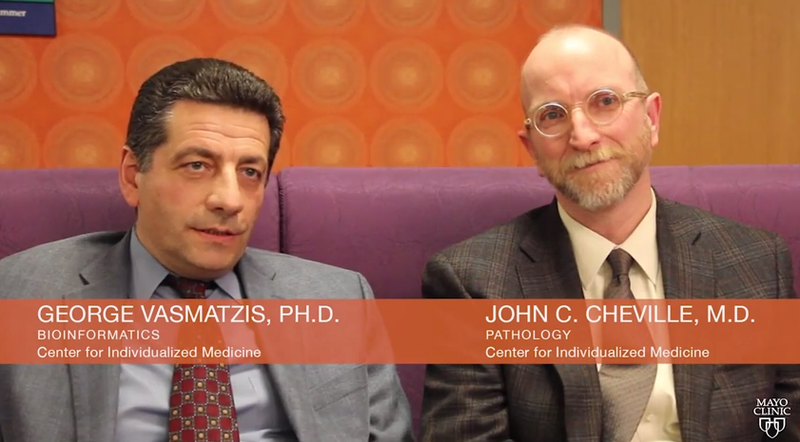 George Vasmatzis, Ph.D., and John Cheville, M.D., co-directors of the Biomarker Program at the Center for Individualized Medicine at Mayo Clinic, introduce us to the world and work of Biomarkers. The Biomarker Discovery Program is a multidisciplinary team that includes oncologists, surgeons, pathologists, molecular biologists, bioengineers, bioinformaticians and others. By combining expertise, the program takes a clinical question, and answers it through a four-phase approach: Discovery, experimental validation, preclinical validation and clinical validation. How do you identify a Biomarker? What projects are you currently working on? What are some challenges you face? Discover the latest in Biomarkers, and Genomics, at our annual Individualizing Medicine Conferencethis year, October 6-8! 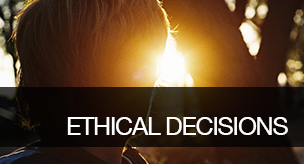 Article Originally Featured on the Mayo Clinic News Network. A Mayo Clinic-led group of researchers has discovered three subgroups of a single type of non-Hodgkin lymphoma that have markedly different survival rates. These subgroups could not be differentiated by routine pathology but only with the aid of novel genetic tests, which the research team recommends giving to all patients with ALK-negative anaplastic large-cell lymphoma (ALCL). Findings are published in the journal Blood. Patients whose lymphomas had TP63 rearrangements had only a 17 percent chance of living five years beyond diagnosis, compared to 90 percent of patients whose tumors had DUSP22 rearrangements. A third group of tumors, those with neither rearrangement, was associated with an intermediate survival rate. “This is the first study to demonstrate unequivocal genetic and clinical heterogeneity among systemic ALK-negative anaplastic large-cell lymphomas,” says Andrew L. Feldman, M.D., a Mayo Clinic pathologist and senior author on the multi-institutional study. “Most strikingly, patients with DUSP22-rearranged ALCL had excellent overall survival rates, while patients with TP63-rearranged ALCL had dismal outcomes and nearly always failed standard therapy.” Dr. Feldman also is a Damon Runyon Clinical Investigator. ALCL is a rare type of non-Hodgkin lymphoma, but one of the more common subtypes of T-cell lymphoma, according to the Lymphoma Research Foundation. ALCL comprises about three percent of all non-Hodgkin lymphoma and 10 to 30 percent of all cases in children. Currently, all ALK-negative anaplastic large-cell lymphomas are treated the same, using chemotherapy and, in some institutions, stem cell transplantation. Results from the study make a clear case for additional testing and possible changes standard of care. When dealing with the findings that having your genome sequenced brings, patients have predominantly been given the choice of either all the information or none at all. The 2013 recommendations did not provide guidance for laboratories to offer patients of any age the ability to opt out from the reporting of IFs. The 56 genes are associated with 24 genetic cardiovascular disorders or predisposition to cancers for which confirmatory diagnostic approaches are available as well as some preventive or treatment measures that can be offered. The ACMG recommended further that those who did not agree to learn of these IFs could choose to forego the entire test. These recommendations generated much controversy, most of which focused on patients’ ability to opt out of receiving unwanted results. “Patients say that being able to have a say in what they learn or don’t learn is really kind of important,” said Jennifer McCormick, from the Bioethics Program at the Center for Individualized Medicine. Much is known about how individuals respond to learning about genetic risk information, but the bulk of those data is from individuals undergoing single-gene testing. These experiences with single-gene testing may not be a fair comparison to WES/WGS testing. With the former, a person knows what is being tested and has sought the test to determine his or her risk for carrying genetic variants causing the disease. In contrast, WES/WGS is not selective, and the results may reveal much more information than originally desired or anticipated. The landscape has changed appreciably, and it is no longer clear what it means to be well prepared to get results from clinical WES/WGS. These issues require additional study in well-designed clinical trials to understand more about the risks and benefits of receiving information on IFs. This is especially true for the release of IFs to children and their parents. The vibrant discussions that have ensued since the release of the 2013 ACMG recommendations are encouraging, including those that the ACMG itself has hosted. It is important that these ongoing updates of the recommendations continue and that the discussions have input from all stakeholders including, but not limited to, patient advocacy groups, regulatory agencies, geneticists and genetic counselors, oncologists, hematologists, pediatricians and pediatric subspecialists, bioethicists, sequencing experts, and industry partners. The recent revisions to the ACMG’s recommendations place greater weight on the diversity of patient interests and the importance of individual autonomy. As many have acknowledged, we need to develop new ways to assist patients in making informed choices that best fit their individual needs and better understand how individual patients perceive actionability. We believe an individualized, patient-centered approach to WES/WGS is necessary and attainable to realize the full potential of sequencing techniques to improve medical care. Read more at the Star Tribune. Article featured on Mayo Clinic Proceedings. 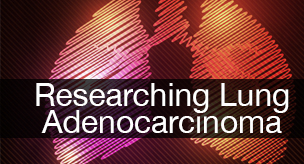 According to a recently published article in the journal Cancer Research, a new study from the Center for Individualized Medicine has found tumor sequencing of several different lung cancers and their surrounding tissue complicates the prevailing theory of linear lung cancer progression and offers new insights for management of this deadly cancer. Sequencing results provide, for the first time, strong molecular evidence of progression from phenotypically indolent components to more aggressive disease and also show that both components can progress independently, even if they arise from the same precursor, according to the study. Future studies of lung cancer genomics and tumor progression are underway from Vasmatzis’ team in the Biomarker Discovery Program. Their goal is to develop a series of predictive biomarkers that can help patients and physicians separate potentially aggressive and life-threatening lung cancers from indolent ones based on the molecular signatures found within the individual patient’s tissue. Full Article Featured on Advanced Healthcare Network. Full Press Release featured on Enterome Bioscience. Enterome Bioscience and the Center for Individualized Medicine at Mayo Clinic have entered into an agreement to begin collaboration focused on the discovery and validation of gut microbiome based diagnostic tests for predicting responses to medical nutritional intervention in overweight or obese patients. A panel of bacterial biomarkers from the gut microbiome, known collectively as MET 230, were identified by Enterome’s scientific founder Dusko Ehrlich and collaborators at the French National Institute for Agricultural Research (INRA) and the Institute of Cardiometabolism and Nutrition (ICAN). These biomarkers enable the stratification of patients based on the health and diversity of their personal gut microbiome, and with a recent 400-patient study, they have been correlated to the metabolic profile of obese patients as well as to their responsiveness to nutritional intervention. “The signing of this agreement with Mayo Clinic is another key corporate milestone for Enterome, and I am very pleased Mayo Clinic will work with us on such an important project. It is clear that new personalized medicine/nutrition solutions are needed if we are going to properly address the growing problem of obesity and its negative impact on public health,” said Pierre Belichard, CEO of Enterome. 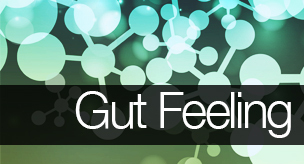 Mayo Clinic is conducting a study currently to characterize the gut microbiome before and after dietary intervention. This study, if successful, would enable the commercialization of a personalized nutrition test for patients with obesity associated with low grade inflammation and certain metabolic risk factors. One-third of the US population is currently obese, and this proportion is expected to increase to 50% by 2030. Nearly $200 billion annually is spent on obesity-related illnesses in the US; while approximately 40% of the US population is dieting at any point in time, resulting in a market for weight management products worth $20 billion per year. From this scientific finding, Enterome, under a license agreement with INRA, is developing a diagnostic test dedicated to the management of obesity and personalization of medical nutrition to patient’s needs. It is hoped that the application of Enterome’s technology will be a key driver for improving the outcome of stratified nutritional strategies and in the future the development of novel drugs or functional food products aiming to decrease comorbidities associated to overweight and obesity (i.e. type 2 diabetes). Biomarkers are molecular substances in the body that can be used to indicate health or disease. These biomarkers can be found in tissue, blood, urine and other body fluids. Prostate and ovarian cancers are two examples of how the use of biomarkers can lead to individualized diagnosis and treatment. Discover the latest in Biomarkers, and Genomics, at our annual Individualizing Medicine Conference this year, October 6-8!